Anelise Hanson Shrout is trained in American and Atlantic history. She received her Ph.D. in History from New York University in 2013, and is interested in encounters between North America and the wider world from the age of exploration in the fifteenth and sixteenth centuries to the early twentieth century – though her definition of “encounter” is quite broad, encompassing interactions between people, animals, plants and even ideas and commodities. 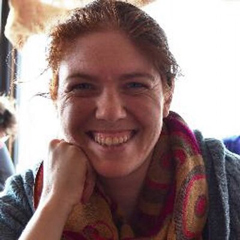 She also works in the digital humanities, exploring the connections between historical data, public history, and experimental history. Dr. Shrout’s research explores the ways in which North American participation in international philanthropy – through donations to victims of famine in Ireland in the 1840s – took on a political character. Her book project, Aiding Ireland, Saving Ourselves: Famine and the Politics of Global Philanthropy traces how apparently quotidian act of transnational philanthropy served as a proxy for political critiques in nineteenth-century America. This book argues that giving to distant sufferers helped donors make claims about their superior morality, and about donors’ own experiences at the hands of states, nations and empires on the other side of the Atlantic. This project has been supported by grants from the Lake Institute for Faith and Giving, Haverford College and the Woodrow Wilson foundation. From 2014-16 Dr. Shrout was a postdoctoral fellow in digital studies at Davidson College. While at Davidson, she worked on a second project – The Digital Almshouse­ ­ – a database which helps scholars to better understand the lives of immigrants in antebellum New York City.